Wyandanch is a suburban hamlet in the Town of Babylon, located less than an hour’s commute of New York City via the Long Island Rail Road (LIRR). 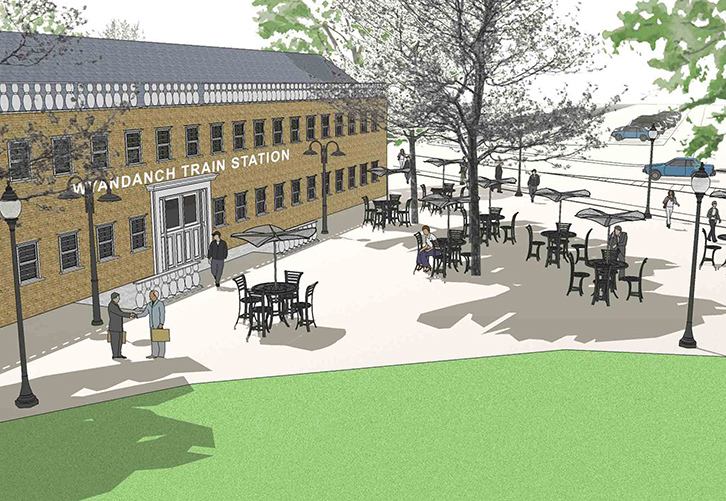 The town embarked on a long-term planning process to revitalize downtown Wyandanch, with leveraging the land located around the LIRR station being one of the strongest opportunities to turn around its fortunes while creating a real place. A new intermodal transportation facility in downtown is the centerpiece of a transit-oriented revitalization program. The overall vision is to transform acres of land around the station currently used for surface parking into a vibrant, mixed-use place through transit-oriented development (TOD). NV5 prepared a comprehensive conceptual plan for downtown Wyandanch that incorporates mixed-use development, structured parking, traffic and transit enhancements, streetscape improvements, and pedestrian and bicycle safety features and amenities. The plan shows a public plaza located near the station, with new development lining one side of this open space. This development would be part of a neighborhood that would be defined by a new roadway network featuring a shared street. The plan was advanced to preliminary and final design, and a master developer was selected to begin transforming downtown Wyandanch through this $500 million redevelopment project.